Here is Margaret Thatcher in her famous Bruges speech, the address that heightened the Euro-sceptic fervour in her party. It was the shrill tone that roused the passions of her ardent followers, rather than much of the substance. Her section on the wider Europe was modest and beyond dispute. "We must never forget that, east of the Iron Curtain, peoples who once enjoyed a full share of European culture, freedom and identity have been cut off from their roots," she said. Now the peoples have got their freedom and identity as members of the EU..... The Tory Euro-sceptics should be raising a glass over this latest treaty, rather than spitting blood once more. And Richards is right too to believe that when this fuss has died down, it will be David Cameron - forced onto territory far removed from his modernisation agenda - who is likely to be the real loser from this whole debate, not Gordon Brown. But the Government needs to be much clearer in selling the different Diplomas about what each is for. That means an end to the paranoia about adjectives like 'vocational' or 'specialised' to describe them. It means openly saying that a level 3 engineering diploma is good enough for university, but that most taking a hair and beauty level 2 will want to go on to work. In other words, it's time to ditch the jargon, and be clear about the product. Otherwise, the danger is that the problems inherent in the 'unified 14-19 learning framework' will become the problem with Diplomas. The government is simply wrong to impose a blanket 5% levy on school surpluses. It is true that some schools have sizeable surpluses that are hard to justify. There is a case for taxing large surpluses, especially where they are not being kept for a capital project, but there is no good reason apart from Treasury intransigence why every school that has planned for a modest 1 or 2% surplus to cover unplanned costs or is saving for a new classroom, should be penalised while a school that is profligate is not. Ministers should either scrap this silly scheme or refine it to something more targeted. With a 16-point lead in the latest polls, the Australian Labor Party is on course for a potential landslide on November 24. In a new poll for the Australian, Labor scores 58 per cent to John Howard's liberal-led coalition's 42 per cent. Half of Australians want Labor leader Kevin Rudd (pictured) as PM, against 37% for outgoing MP Howard. Rudd has won televised debates and is now opening up leads on economic credibility, the one area where Howard might have hoped to capitalise on his government's record. Even a massive tax-cutting wheeze seems to have made no difference to Howard's fortunes. Rudd has made education one of his big issues, and now enjoys a 30-point lead on the subject: one of his most important plans in the federal country is a national curriculum covering English, Maths, Science and history. It looks like the formula for victory in Australia in 2007 is not so far off that for New Labour in 1997. I don't normally cheer when a conservative or Christian Democratic party wins an election. But on this occasion, three cheers are in order. Sanity has been restored to Polish politics, at least to the premiership. One of the more troubling - but perhaps inevitable - aspects of post-Communist Eastern Europe has been the growth of extreme-right populist parties. So it is a cause for real celebration when the voters so firmly give them the boot as the Poles did last to Jaroslaw Kaczynski's Law and Justice party. Civic Platform, even with the peasant party, they have a good chance of returning Poland to the European mainstream. Irwin Stelzer makes an excellent case for inheritance tax in this week's Spectator. I'm sure it will fall on deaf ears in the current climate. So, the dreaded Euro-Treaty has been signed. How much longer do we have to put up with Euro-sceptic fanatics forecasting the end of civilisation unless we have a referendum to stop it? Perhaps even more tedious are those Tories who imagine that the increasingly strange antics of Gisela Stuart reflect the views of the majority of the Labour Party, and that the European issue will do for Gordon Brown what the 'bastards' did to John Major. Even Fraser Nelson, whose analysis in the Spectator can sometimes be illuminating, seems to be suffering from a serious dose of wishful thinking this week. When I first came to Britain in the early eighties, one thing you could say about the Daily Telegraph was that it was a newspaper. It had its trenchant opinions in the comment pages, but you could rely on the Telegraph, perhaps more than any other newspaper for an honest account of the news. Of course, most broadsheets have abandoned C.P Scott's dictum to a greater or lesser extent since then, but none more so than the Telegraph. Today's ludicrously one-sided account of the GCSE results shows that it no longer knows the difference between comment and fact. Statistics are presented like confetti, lacking in context or any sense that they know what they are talking about. You do not need a grade C in GCSE Maths and English to have 'mastered the 3Rs'; though it is certainly desirable if you plan to pursue A levels or further academic education; and the government has rightly set targets to increase the number of GCSE students who do so. However, the 90.7% of youngsters who achieve level 1 in functional maths and English are a better proxy for 'mastering the 3Rs' if the 3Rs are the basics. And if the GCSE English and Maths exams are as easy as the sneerers at the Telegraph imply, why do over a third of independent school students not reach this standard? So, let's be clear about this. Achieving five good GCSEs - at grade C or above - in English and Maths is not something everyone will achieve (though over time a clear majority could). Indeed, many students get a C in English, but not in Maths, (go to second Excel file, table 8) or vice versa: 60% get a C in English, and 55% do so in Maths. With O levels, fewer than a quarter of all students got a C in these subjects. In 1997, just a third did so. Today it is nearly half. More to the point, as a far more intelligent piece in the Guardian shows, what matters most is whether and where improvements are taking place. And the evidence is that improvements are fastest in the poorest schools in the poorest areas, and in academies serving those communities. The GCSE results (go to table 5 in the second excel file) published today are a mine of interesting information, not least because they generally get fairly scant coverage in the media and the DCSF obscures the details. Yet unlike much of what does get covered, these figures reflect the results of 650,000 individual students. And some are very interesting indeed. For example, we have been led to believe that it is state schools that are somehow letting down their students by not getting them 'proper' GCSEs - that is GCSEs including English and Maths. These figures suggest that it is independent schools that have inflated their advantage more than any category of state schools. And non-fee paying city technology colleges - the government model for academies - do better than any other category of school including fee-paying independents. The figures show the proportion of students gaining five GCSEs or equivalent at grade C or above including English and Maths, with those for any GCSEs in brackets. You may wonder why these figures are not reflected in those highly publicised censuses and press releases published by the Independent Schools Council: it is because the ISC does not represent the entire independent sector (just the better schools). These figures do. And because they do, they are more accurate. But don't expect to read too much of this in the newspapers. If August is the month when young people learn their GCSE and A-level results, October has become results season for the government. Yesterday saw the publication of Christine Gilbert's annual report as chief inspector (pdf). Today, the government has published the national levels of achievement at GCSE, while the Public Accounts Committee has issued its latest verdict on academies. To judge by some of the headlines, you might imagine the school system has got worse over recent years. But here are a few interesting things you might have missed. “But academies are intended to raise educational achievement in deprived areas; lower results compared with secondary schools overall do reflect the circumstances and prior attainment of the pupils. If academies’ performance is adjusted for these factors, then on average it is substantially better than that of secondary schools overall" - Edward Leigh, Tory Chair of the Public Accounts Committee. Press release accompanying PAC report. Also, Ofsted, which rightly toughened its inspection criteria a couple of years ago, has found 13% of primary and secondary schools to be outstanding, merely a 'slight' increase from 10% last year sniffed the Guardian. Actually, translated across all schools, it means the number of outstanding state secondary schools is up from 320 to 416, the number of outstanding primaries has risen from 1800 to 2340, while the number of inadequate schools has fallen by a quarter. Anybody confusing Liberal Democrats with nice people would have had their naivety cruelly dashed (yet again) yesterday. 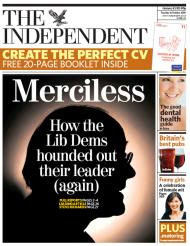 With an inhuman ruthlessness reserved for despatching their leaders, the LibDems saw off Ming Campbell without sensitivity or sentimentality. Unsurprisingly Ming left a broken man, avoiding even the usual farewell interviews. Doubtless they will have the good sense to elect Nick Clegg to replace him (which might at least give Ming some satisfaction if Chris Huhne really did play Brutus this time). Such ruthlessness has long been a feature of Liberal by-election campaigns, but one wonders how the average LibDem voter views it all. Even the party realised it had gone too far when Paddy Ashdown had to be lined up to soothe feelings on this morning's Today programme. 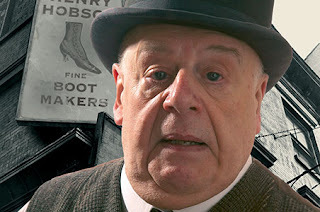 The whole shoddy business leaves a nasty taste in the mouth, even for the most seasoned political observer. Reports that the BBC is determined to save BBC World from cuts despite 'losses' of £15m a year miss the point. It is important that the BBC retains its international TV as well as its radio service, which is often a beacon of truthful reporting in countries lacking independent media. But its news bulletins could be sharper, and license fee-payers might feel more affinity with the service if it provided even as much UK news as CNN does. BBC World has a fetish about ignoring British news, even though many of its viewers are British tourists watching in hotel rooms. That should change. And why can't we watch BBC World on digital TV here except for the odd bulletin on News 24 or BBC 4? The radio world service is now available in the UK on digital. TV should be too. Jackie Ashley is right in her observations about the fickleness of the press when it comes to Gordon Brown. But hasn't the real problem been - as John Rentoul recounted yesterday - the extreme fickleness of Polly et al on The Guardian? Today's polls, giving the Tories leads of 4 and 7 points cap a bad week for Gordon Brown, though his personal ratings remain stronger than David Cameron. Contrary to the excitable reports on some of the media, as Anthony Wells points out, it puts the Tory lead back to their March levels, and is not quite the 'biggest lead in 15 years'. Moreover, these figures are truly woeful for the Liberal Democrats, as Labour's vote at 36-38% is higher than earlier this year when it was 30-33% - Labour needs a Liberal Democrat recovery at the Tories' expense to win in key marginals. about how he can put the country right. That demands more statesmanship and less gamesmanship. It's a strange thing to say about a man who waited for the job for so long, but the thing that Gordon Brown most needs to do is act like a leader. If he wants to be a long-term Prime Minister, then he needs to start behaving like one. His ability to meet that challenge will decide whether the last fortnight was a blip or the beginning of something more serious. Of course, commanding poll leads can so easily be reduced. But it is worth looking at the details of the latest Fox News poll (pdf) of what Americans think about their candidates, and pausing to marvel at the sheer hold that Hillary Clinton now has on American politics. Sure, she is now 32 points ahead of Barack Obama among Democrats. But that's not all. When asked who was qualified to be president, 47% said Clinton was very qualified against 34% for John McCain, 32% Rudolph Giuliani, 23% Obama and 16% for Mitt Romney or Fred Thompson. And 44% of Americans expect her to be the next President, against 12% for Giuliani. Of course, there is still far to go, with frontrunners often suffering in the primaries, and the RealClearPolitics average poll of polls gives her a narrower 5.5% lead over Giuliani. The Economist last week explained some of the reasons, but it is still extraordinary how Hillary has managed to create such hegemony over the US body politic. Ambivalent is code here for: they didn't conform to our prejudices. As the Times notes in its leader this morning, this is a report based on the instincts of the 'educational world' rather than any objective evidence of what testing, inspection and the national curriculum has achieved and can do. For schools that use tests and assessment regularly and confidently find that they help children improve, and contrary to what the author of Toxic Childhood Sue Palmer proclaimed also on Today, tests and targets have helped disadvantaged pupils and their schools to improve faster than middle class schools and pupils. But the assessments, which are known as the Foundation Stage Profile, were criticised by teaching unions last night. Mick Brookes, the general secretary of the National Association of Head Teachers, called them “unreliable and unhelpful” because they are based on subjective teacher observations, not tests. Now there's a challenge for ministers. 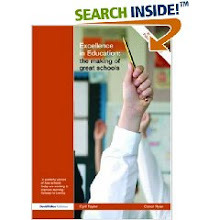 When the assessments first started, there were attempts to create a single national system of baseline assessment. Thanks to the sort of people who would prefer other people's children not to learn to read until the age of eight the profiles have become unwieldy and less useful than they might be. So, let's cut the areas of assessment and have a single short national set of criteria to make them into the reliable and helpful data that Mr Brookes is presumably calling for. Meanwhile, ministers must go further than just saying that 'tests are here to stay'; they need to explain why and how. And they need to get on the case quickly. "I doubt that making the exam regulator more independent will stifle the sneerers so long as we still have competitive eam boards with little incentive to make exams tougher. Or a sytem of marking where an A or a B, a Level 4 or 5 varies in value from year to year, and paper to paper. Nor will it alter the mindset of commentators who long for the days when few went into higher education rather than the 42% of young adults who go to university now. "But there’s a more fundamental problem here: independence reinforces the notion that politicians can’t be trusted. Yet because they are elected, politicians are more likely to act as guardians of standards than independent agencies, especially where those agencies become creatures of a prevailing professional orthodoxy....Schools and education policy should not be the preserve of the professional elite. If society – through the ballot box – wants standards maintained or improved, then their elected politicians should be held accountable for providing that reassurance. "But they can’t do it by handing all their power to unelected quangos, whose instincts may be towards introducing measures that militate against what the public wants.... Of course ministers should have no power over grading decisions. That would be wholly improper. But they should be able to make strategic policy decisions in the public interest, including whether to allow coursework, permit resits or have national tests for 11 and 14 year-olds. And teaching unions or teachers who don’t like such policies should be able to influence, criticise and quiz ministers, in the same way that parents, students and employers can. However, without responsibility, politicians have no power." Grammar school policy has been a headache for both main parties. This year, the Tories came unstuck trying to ditch support for more selection, while explaining what would happen in selective areas if demographic change required new grammar schools to maintain an existing balance. 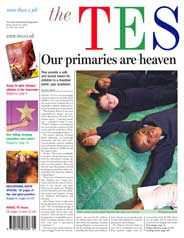 Twelve years ago, Labour was determined to avoid its entire education policy being hijacked by the grammar school issue, which is why in the 1995 policy statement Diversity and Excellence, the party made clear that it would not allow local authorities to close grammar schools; instead it would be a matter for parents through local ballots. To quote the 1995 document for the benefit of younger BBC online hacks: "...while we have never supported grammar schools in their exclusion of children by examination, change can only come through local agreement. Such change in the character of the school would only follow a clear demonstration of support from the parents affected by such decisions." As it happened, the then shadow education secretary David Blunkett, battling Roy Hattersley over grant-maintained schools, used the 'read my lips: no selection either by examination or interview, under a Labour government' phrase in his speech which helped secure the passage of the new policy on grammar schools. Blunkett made clear - as did I - to any interviewers and journalists that he was referring to new selection. And crucially - although this is never reported - he made it clear in his 1996 conference speech a year before the general election. The policy was firmed up ahead of the 1997 Wirral South by-election, where the issue threatened to prevent Labour's candidate Ben Chapman from winning a victory. Newspapers were briefed that ballots would only happen when a fifth of parents petitioned for one (see, for example, The Times 7 Feb 1997). Further details, including that the parents would be those from feeder schools, were also provided. In government, those rules were enshrined in law, and only one ballot - at Ripon - has ever taken place, where parents opted to keep the existing selective system. (This, incidentally, was a position backed by the main local modern school which has since improved significantly in partnership with the grammar). There were occasional flurries in the media on the issue and fanciful suggestions that the government was trying to destroy good grammar schools. But ministers knew that there was no point opening up such a divisive issue unless there was a real groundswell of opinion in favour. As ministers look at the rules for ballots again, I hope they remember the history of all this. This is not a vote-winner: it could be a real vote-loser. Far better to build on the idea of grammar school partnerships and leave the existing ballot procedures to be used when there is a genuine groundswell of opinion for change. More than three quarters of teachers interviewed believed they have greater control over their work and more time to plan lessons, mark books and collaborate with colleagues thanks to a "revolutionary shift'' in school working practices. Teachers felt they had greater control over their work, had time to plan collaboratively, develop resources, keep up with assessment and liaise with colleagues, improving their lessons as a result. Most schools believed strongly that standards were rising as a result of the reforms. Pupils are benefiting from increased support from this wider workforce. Deploying adults with different skills is allowing schools to improve the care and guidance for vulnerable pupils and those at risk of exclusion. The reforms were helping to extend and enhance the curriculum in nearly three quarters of the 99 schools visited. Yesterday's pre-budget report and CSR announcement were necessary and good politics. Being accused of being a magpie and stealing Tory clothes is not a charge to keep the PM or the Chancellor up at night. (Nor is David Cameron's accusation at PMQs today that Gordon Brown 'looks phoney': the colour scheme for pots and kettles springs to mind.) In education, there is more money for primary school building and a new raft of targets which require minimum achievements in both English and Maths at each stage. So far, so sensible. But, Gordon should study two comment pieces in this morning's papers. Jonathan Freedland sets Brown his main task in the months ahead. From now on, the Brown administration needs to do less politics and more governing....One minister tells friends that the trouble with the Brown team is that they are obsessed with politics, never able to resist a neat manoeuvre here, a little jab there. The PM needs to prove them wrong, getting on with the quiet, steady business of running the country well.....A year from now and we shall be in the run-up to the 2009 election. He has 12 months in which to think and act big, not play catch-up with the Conservative party. This was the Gordon Brown we waited for. Now we want to see him. And, although it may be a little tongue in cheek given its source, Danny Finkelstein makes a good point about the Year Zero tendencies of some Brownites. The public think of 1997 as when the new Labour government was elected, not 2007. Ministers need to remind people of what has been achieved and learned, and build on those achievements and lessons, as well as promoting new ideas and borrowing from the Tories. Employers should more readily be able to help design programmes that meet their needs, and this won't always be done through sector skills councils. Many providers, including learndirect and some colleges, run centres in larger company premises. And they need to have greater flexibility both in funding and qualification recognition to design the courses that will benefit local employers and employees most, even if that doesn't immediately fit into the level 2 - or level 3 - straitjacket. Bite-size qualifications should not just be encouraged; they should be better supported financially. That's where the new skills accounts are so important. The first individual learning accounts suffered from fraud, a problem of lax regulation, rather than the concept of an account that people can use to help support their own training. Well-regulated accounts work successfully in Scotland and Sweden, with trials under way in other European countries. Hopefully, we can move quickly from pilots to a universal system. Politically, the level 2 pledge cannot be watered down. But there is no reason why the individual employer should not have a proper skills account for training that is not free as well as the employee. Their Train to Gain account, if you like. They could then see a full menu of available training - with government subsidising 50% of its cost - and use that account to buy what they really need from local providers. It would be more appealing and potentially more effective than any levy, and could also be linked to university courses. The far greater problem is a gradual and long-term erosion of journalistic standards and seriousness in favour of the sensational and the meretricious, and the incredible self-deceptions that executives have to go to in order to justify this trend. Yesterday was not the best day of Gordon Brown's life. An uncomfortable press conference, a sneering media and a revitalised opposition combined to undo his carefully cultivated image of the summer. However, a new Populus poll in today's Times suggests that he retains strong underlying support: Labour is two points ahead of the Tories on 40-38%. The conference season may have strengthened the confidence of Tory supporters in the economic wisdom of their leaders, but it has had little impact on other voters. Brown and Alastair Darling remain well ahead on economic trust: Darling must reinforce that impression with his pre-budget report and spending review announcements today. But all this won't be enough in the medium to long-term. It is to be hoped that Brown has now had his share of mini-disasters. So he needs to demonstrate strength on the public services. That means more than keeping the basic Blair reforms; he must embrace them as his own. In his first weeks, Brown threw a few bones to anti-academy backbenchers, but as Fiona Millar demonstrates in today's Guardian, those campaigners won't be satisfied without abolishing Academies - the most successful sustained effort to tackle school failure in decades. Brown should ignore these siren voices, and talk up Academies. It isn't difficult: their improvements continue to outpace other schools, and their structures present a readymade picture of progress for the voters. By all means continue with efforts to boost the 3Rs too, but don't underplay Academies. Equally, Brown must become a stronger reformer on the NHS and police: after all, he faces the charge that as Chancellor, he poured money into pay and staffing with little return on productivity. So he is right to personalise these services, and demand weekend surgeries. But he must be bolder in saying where he believes things should be ten years hence. That should be the vision which, as he himself says, he now has the freedom to explain. I have a piece in today's Guardian, arguing that young people need to be given real choices in post-16 education, and that schools should be obliged to ensure they know their options. You can read the article here. I've just finished reading Andrew Anthony's The Fallout, a book I wanted to like more than I did. Anthony has come to realise that many of the liberal pieties that grace London dinner parties and Guardian op-ed pieces don't reflect the realities of the world we live in. His catalogue of anti-racists who believe only white people can be racist and Trots and Islamists conniving in the Stop the War coalition rightly invites ridicule. But as with Nick Cohen's recent entertaining diatribe What's Left?, one wonders who his real target is. 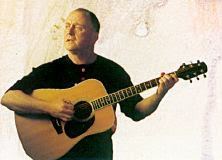 When I came to London from Ireland in the early eighties, there was certainly rather too much political correctness in the circles within which I mixed, and it was with some trepidation that I decided to criticise the miners' strategy during the strike at my first Islington Labour Party meeting: I needn't have worried; most people there thought Arthur Scargill was behaving like a fool. Similarly, I have never encountered howls of outrage among Labour or liberal friends over the years when questioning many of the things that have recently excited Anthony's ire (or which have long excited the Daily Mail). So while I share many (though not all - I disagree with him on faith schools for reasons explained elsewhere) of Anthony's views, I doubt they will shock or surprise as many people as he imagines. Perhaps in the cloistered world of the Guardian Comment pages, these views are strange or shocking. And, sure, there is a lot of opposition to the Iraq War (which I supported on humanitarian grounds given Saddam's record) but liberal political correctness of the type Anthony fears is less widespread than he thinks. His is an attack on the conventional liberal wisdom of the 1980s (updated to deal with those who appease militant Islamism today), and it is trenchant and well-written at that. But there are rather too many Aunt Sallies for my liking. Andrew Rawnsley has a good analysis of what got us to where we are today. It was a mistake to allow unfettered speculation without a clearer exit strategy. But this is an opportunity for Gordon Brown as well as a temporary setback. It is true that the Tories are ahead of Labour in some polls today. But Labour is now at a healthy 38% rather than in the low thirties: a sense of proportion would show this to be a lead that is eminently recoverable. Brown's reputation has suffered a knock - and this may cause a frisson among those who hated the speculation he allowed to continue about Tony Blair before last year's party conference - but a strong period of power and good leadership will sort that out. He is still more trusted than Cameron, and seen by a large majority on YouGov to be doing a good job as PM, as well as keeping a lead on many key issues including the economy. But Brown now needs to be bolder on policy, and not just a good manager. He should be prepared to embrace real reform in the public services and be seen to do so - Academies, for example are a potential Labour triumph, embraced by the Tories - and he should squash stupid distractions like efforts to encourage battles over grammar schools that would do more than any snap election to destroy Labour's hopes in many of its South East marginals. He must also neutralise the popular Tory policies on inheritance tax and stamp duty and show that Labour remains the party of aspiration and hardworking families. The extent to which he does so will determine the extent to which today's headlines are a momentary media maelstrom or not. It must be twelve years since I last saw the Saw Doctors live, and I'd forgotten what a great act they are. Tonight we saw them at Fontwell race course, wrapping up a great day of racing with a bravura 90-minute performance. Who else could make the N17 sound as magical as Route 66? Thank goodness for that. There are real lessons in what happened over the last month: Gordon should never have allowed his advisors to leave speculation on an election to run as long as it did. By doing so, it makes Gordon look weak after a summer of strength. But it is the right decision not to go to the polls now. Let's rule 2008 out while we're at it, and get on with running the country. It's not as if Gordon hasn't been aching to do so for some time. 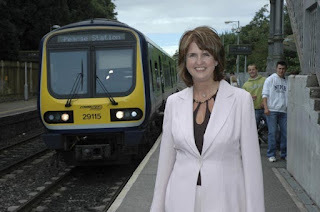 I'm delighted to see that my old friend Joan Burton has been elected deputy leader of the Irish Labour Party. She is just what the party needs to re-capture urban enthusiasm. A shame she didn't go for leader. 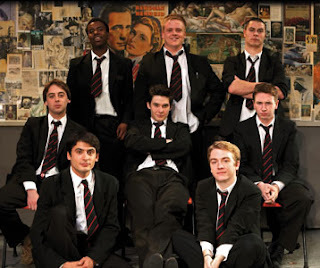 I finally got around to seeing Alan Bennett's The History Boys this week, as the National Theatre's fine production of the story of young men in their term before university reached Bath. It is seen by many as a critique of the supposedly valueless drive for targets and results in the modern education system, and we are supposed to be rooting for the anarchic Hector (his molestations aside) through all this. And yet. What struck me most was the underlying assumption that the students shouldn't be setting their sights on Oxford and Cambridge (though it presumably did Bennett no harm). As Libby Purves persuasively argued in the Times earlier this week, that is why our two leading universities don't get the proportion of state pupils whose results would justify admission. The education politics aside, this is a truly wonderful production of a very fine play, with a splendid set of characters and a cast on top-notch form. I gather it is back on the West End later this year. Don't miss it. Despite the raft of polls, suggesting a narrower lead for Labour over the Tories in the wake of the Blackpool conference, I think an election is probably more rather than less likely. But I find Martin Kettle's arguments in today's Guardian persuasive. So should Gordon. His speech....did not change the calculations about when that election will be. It did not bomb and thus tempt Brown to press the button. It was not a belter that forced the Prime Minister to hold off. Next week's decision is still finely poised....The problems for Brown are those of substance. If he does call an election next week, what is it about? What are the pressing challenges requiring difficult decisions that were not in the 2005 manifesto? In the longer run, an early election, even assuming Labour wins by a reasonable margin – and a majority of 66 is harder to obtain because of boundary changes – could hasten the decay of Brown's authority. The moment the election is over, the question moves on to: "Are you going to fight the next one? Who will be the next leader, Ed Balls or David Miliband?" David Cameron's so-so speech leaves Gordon Brown just where the Conservative Party wants him: between a rock and hard place. I have been watching David Cameron talking about education. Maybe the absence of notes is addling his brain, but he can't be allowed to get away with his crass assertions about what has and hasn't happened in education. He says 'if we don't understand why Labour has failed, we won't get it right'. Labour has certainly not failed, but if he doesn't know the facts, he won't get it right either. First, there are not 50% of pupils not getting level 4 in reading, writing or maths. That was true in 1997. It is not today. In fact, almost 80% reach the standard in English, and 76% do in Maths. I don't know how they taught maths at Eton, but that suggests 20% not 50%. Since Labour is already introducing synthetic phonics this year and remedial lessons in the 3Rs, he is not offering anything new here. Second, on discipline, there are twice as many pupils excluded and in pupil referral units now as there were in 1997, and only 120 excluded pupils are returned to schools each year. I have great respect for heads (and some sympathy with the idea of requiring parents to sign home-school contracts) but the idea that these cases would not end up in the courts is fanciful nonsense. Third, on diversity, Gordon Brown has actually accelerated academies - contrary to expectations, maybe - but he has done so. And the legislation already requires new schools to be open to competition from new providers - again a Labour innovation. There are a small but growing number of bodies getting involved, but there is unlikely to be an explosion of such schools. And finally, doesn't David Cameron know that far more special schools closed under the Tories than under Labour, and despite the best efforts of Tory councils - yes, those bodies who we should leave alone to spend 'their money' (not ours, I note) - Andrew Adonis has imposed an effective moratorium on their closure? Perhaps if Cameron understood these facts, he might then stop talking down our increasingly successful schools. Perhaps the ugliest thing about Cameron's Tories is the amount of sanctimonious cant that has been emerging from their front bench over the last week. First we had their culture spokesman demanding Culture Secretary's James Purnell's resignation over an amusing, but utterly trivial, misunderstanding over a publicity shot for a local hospital. Granted it has produced some entertaining follow-ups, but this was no resigning matter. Then we had George Osborne moaning that Labour had dared to cost their back of an envelope calculations for removing incentives to work from the children of the top 6% of wage-earners, and found their figures were hopelessly awry. As Adrian McMenamin has pointed out, such calculations are hardly novel. And as the Treasury has explained, they were accurate. Finally, we have had the smarmy Liam Fox complaining that the Prime Minister has gone to Iraq and deigned to tell the troops that 1,000 of them would be coming home soon, before he told MPs several thousand miles from the frontline. He did so in a week when Prime Ministers traditionally go abroad as (a) parliament is not sitting and (b) he really couldn't be expected to sit at home watching Mr Fox's speech. To imagine that this lot thinks they are ready to run the country. The UK will be judged both by how we treat our own people, and also by the standards that prevail in our external behaviour. Inconsistency will be spotted. Quite. Hague cheekily ended his Today interview by pointing out how interventionism had worked well (with Blair's support) for the people of Sierra Leone and Kosovo (where Milosevic was defeated). Ouch! Today's newspapers have gleefully alighted on the definition of underperformance offered by Andrew Adonis yesterday, as he announced his plans for closer working between the private and state school sectors. Adonis now targets around 800 schools with fewer than 30% five A-C grades including English and Maths in 2006. He is right to do so. But he should also give these figures some context. How many such schools were there in 1997? There were nearly 1300 schools with fewer than 25% of pupils getting five good GCSEs including English and Maths in 1997, and their number had fallen to 500 in 2006. (Of those getting any GCSE, the number with five or fewer had fallen from 616 to 47). And half of secondaries in 1997 - or 1600 schools - were not meeting this new 30% target level. Equally, the number of non-selective schools with 70% or more five good GCSEs has increased from around 83 to 600 between 1997-2006, and the number of schools deemed failing by Ofsted is half its 1998 peak level. That doesn't make the challenge now any less, but it does show rather more progress than Labour's detractors (or its ministers sometimes) are ready to admit. Context matters. Today's publication of a prospectus encouraging successful private schools to get involved in Academies, on the same day that the Girls’ Day School Trust announces that Birkenhead High School is set to become the latest successful independent day school to convert to an academy, is a sign that the radicalism and diversity of the new Labour education project is alive and well. The announcement is being made by Andrew Adonis who is also tempting private schools to sponsor weak state schools that become academies. It is a shame that Ed Balls found no time to mention any of this in his speech to conference last week, because this is where Labour is being truly radical in tackling both underachievement and the historic apartheid between English private and state schools. So these are the Conservatives' big ideas for education, from shadow schools secretary Michael Gove? Abolishing exclusion appeal panels that are weighted in favour of the school for courts, which aren't, will increase not decrease the number of 'thugs' returned to schools. If it were so simple, don't you think that the government would have scrapped the panels already or heads' leaders wouldn't be backing their continuance. It is good to see the Tories speaking up for good comprehensives. But otherwise they differ little from Labour: the government already requires competitions for new schools and requires councils to do proper feasibility studies for new school proposals from parents and others. Extra cash already goes to schools with disadvantaged pupils (incidentally, if you tie it too closely to individual pupils, you get accused of penalising exclusion, as Labour was by the Tories when it tried a similar scheme before). There is already plenty of Blackpool hot air - if that's not too much of an oxymoron given the normal ambience of that resort - coming from the Tory conference. Irish politics is once again polarised. Bertie Ahern's account of how he obtained £30,000 in cash for his personal use when he was finance minister has divided the country. Fianna Fail politicians swear allegiance to their leader. The opposition smells a rat. The commentariat is split too, as yesterday's Sunday Independent showed with strong pieces by Brendan O'Connor (the case for the defence) and John Drennan (for the prosecution). I grew up in an Ireland where corruption bedevilled our politics, personified by Charles Haughey but exemplified in numerous cases of rezoning where councillors (and some senior politicians) enjoyed backhanders for their troubles. Whatever Bertie is supposed to have done seems tame by comparison, and opposition politicians are all too ready to shout 'fire' at the first whiff of a lit match in politics these days. Bertie enjoys enormous credit for his economic policies and his successes with Tony Blair in Northern Ireland. But his explanations for where he got all this cash are not yet good enough, nor are they clear enough. It is not sufficient to cite memory loss when so much cash is involved. He must provide a better explanation of the circumstances before the Tribunal ends. Or he must step down. Ireland cannot afford a return to the political culture of the eighties.